Great news today from Homer Hill in Monson, Maine. Yesterday (Wednesday, December 5) at Eastern Maine Medical Center in Bangor, Maine, Mary and I met with Dr. John Klemperer, the surgeon who performed her aortic valve replacement procedure on November 1. Mary had been making good progress for weeks, so we were optimistic that he would probably reduce the number of post-surgical restrictions in place since her operation. Still, we weren’t prepared for what actually happened when he walked in the door of the examining room at about 1:13 PM. Just like that. Mary was suddenly cleared to drive, sleep on her side, discontinue all post-surgical meds, stop wearing TEDS, end all spirometer exercises, vacuum the house, do the laundry, and resume most everything else that was part of her normal routine before aortic valve stenosis ever became an issue. And the doctor was saying all of this just five weeks (today) from the date of her surgery. Amazing. We couldn’t have asked for more. He briefly examined Mary’s wounds, listened to her heart, and answered a few more questions. Then he verified what he’d said when he first entered the room and was gone. It all happened very quickly. We immediately began trying to comprehend what this sudden development was going to mean for us. On the way back to the hospital lobby to meet with Vin Upham (Vice-Chairman of AIIA’s Board of Directors and retired minister from New York who has been our caregiver over the past five weeks), we began to realize that, if this was indeed where things stood, Vin should probably be released to return to his home and wife, Charlene. So when we got back to Monson Vin filled the wood box, filled both of our vehicles with gas, and took care of a few other odds and ends. Then, after a good night’s sleep, he was off — on the road even before 8:00 AM this morning. What Vin has done for us since his arrival over five weeks ago should be carefully marked and remembered as a powerful example of what it means to serve others in the name of Christ. 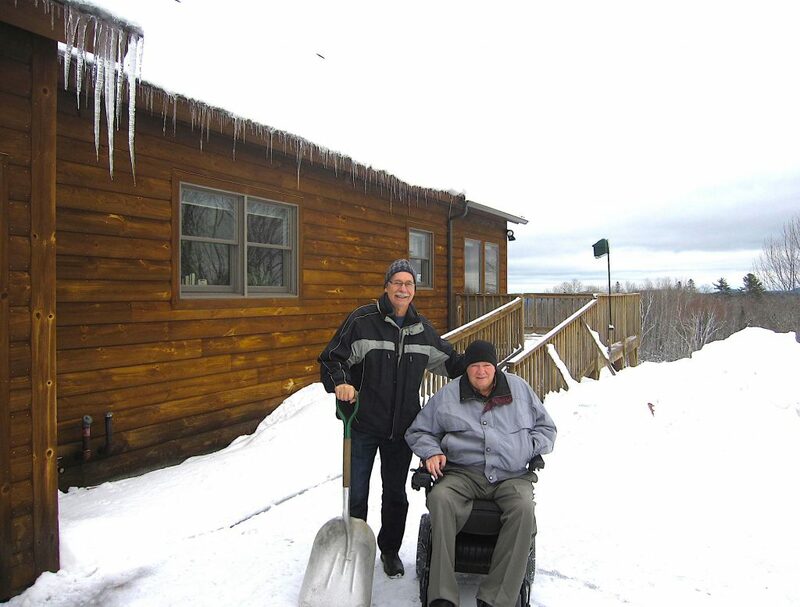 He set aside his own comfortable retirement schedule, took some unknown risks, got his hands dirty, hauled our garbage to the dump, painted a wall at the Study Center, made a cherry pie, baked fresh bread, built many wood fires, shoveled lots of snow, and much more. For doing this he sought no attention and refused all payment. And he did it with a positive spirit. As an added bonus for me, Vin was conversant on key matters that we both care deeply about — theology, apologetics, the glory of God, and the best way to influence culture and introduce people to Jesus. The morning after helping me to get a hot shower he got up, put on the coffee, served up some waffles, and then — after discussing a morning devotional reading by Charles Spurgeon — engaged with me in a lively discussion on the critical difference between the economic and ontological subordination of the Son to the Father in the relationship of the Holy Trinity for eternity. Like I said, things that really matter. Tonight we are most grateful to God for seeing us through the events of November 2018 which we had long dreaded but which are now history. We don’t know what may await us tomorrow or next week or next month, but tonight all seems well on Homer Hill. Thank you for praying for us and journeying along on this adventure by means of reading this blog. I hope that you will continue to read as we post on other matters in the future. Meanwhile, have a very Merry Christmas. NOTE: Although Mary and I read all of the public comments made in response to this blog, we typically only reply to personal email. If you choose to send us personal email you can address it to AIIA@AIIAInstitute.org and put the words “Personal to the Witmers” in the subject line. Such great news, Mary and Daryl – praise God! All we can do is echo Deb! We’ve prayed for this so why should we be surprised! Praise God for how well Mary has done! Thankful that she is cleared to do the things that she did before. What a relief for you both to have some normalcy again in your home. But Vin sounds like someone who was totally God sent to you. Jesus’ hands and feet to you both. He heard the call and obeyed. God bless him. Continuing to pray for you both.